Technician showed when I was told they would,fixed my a/c will highly recommend them to friends and family. Its nice to know there are still respectful and honest companies in the business. Will call them in future for service on a/c and furnace. Scrib's Heating and Cooling of Oxford replaced a heat exchanger that was still under warranty on my furnace and installed a new wifi thermostat so I can monitor my HVAC system remotely, make adjustments, and receive alerts if there is a problem on my phone. The workers were clean and efficient with the work. Very happy with the service! Scrib’s Heating and Cooling have been taking care of our homes for years. Dan and his guys are the best! There’s never a delay between a phone call and a service call. Everyone with the company is friendly, and polite. They replaced our furnace in a matter of hours of us calling about a problem. They were clean and neat and we’ll continue to use them for all our heating and cooling needs. Dan is smart, competent, honest, trustworthy, prompt, reliable and dedicated, as is his crew. We have called on Dan for several years, and he never disappoints! He always looks for the most efficient and cost-effective way to solve a problem. He is always there for us, showing up and fixing any problems right away for a very reasonable cost. He also seems like a good family guy. We would highly recommend him to anyone! Dan is the MAN...great quality work, always available and been with him for years! Highly recommended. Awesome service, knowledgeable, and fast turnaround time. Highly recommend Dan and his company! Needed a new furnace and Dan made it happen . thanks to Dan and his crew. If you are ever in need, I highly recommend Scrib's Heating and Air. Thanks again guys! Scrubs Heating and Cooling is a company that understands and delivers great customer service. Highly responsive. Great follow up. Knowledgeable and trustworthy. I have recommended them to others who have enjoyed the same experience. I highly recommend them! Dan and his crew did a great job, and in less time than estimated, tearing out our 50+ year old beast of a furnace and replacing it with an efficient unit. They also replaced our AC unit which had died last year. And all of this at a competitive price. Overall a very professional job and both Dan and his crew were very easy to work with. They showed up on time and finished the job early, both firsts for us when having work done. I found the folks at Scribs heating and cooling very personable and professional. Their attention to detail is obvious when looking at their work. I got great service at an excellent price. Complete tear-out and install in one day! Thank you VERY much. Excellent service. Trustworthy and honest service techs. Explained every step of the install process on my new furnace. All around great experience. I have know Dan for many years and trust him and his crew completely. He has done work at my home and business and always does an excellent job. I have referred many of my friends to him as well. Nobody better in the trade than Scribs. Him and his crew do great work. Honest and trustworthy. Scrib's Installed a whole house humidifier in my log home in Lake Orion and I am completely satisfied with the service. Great job! 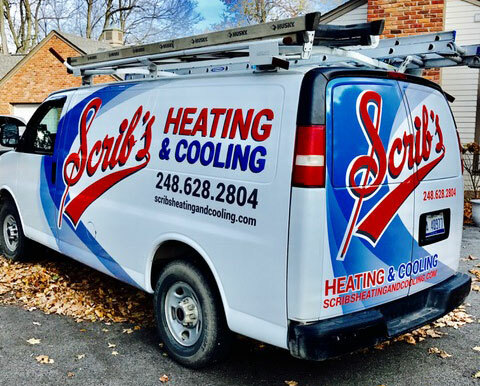 We used Scrib’s Heating and Cooling in Oxford Michigan. They will not try to sell you anything you don’t need, and even showed us what to do to prevent further furnace issues! Very trustworthy! Scrib's Heating and Cooling in Oxford came to my rescue with a new home purchase to get the furnace and humidifier working properly just in time for the heating season. Thanks! Awesome Company! Mr. Scribner came out himself during the holiday season with a sense of urgency. He not only quickly fixed my furnace but educated a first time home owner on the most efficient ways to heat a home. I look forward to working with him again! These fine folks do excellent work. They are very efficient and professional. Would highly recommend. Been working with Dan for a number of years, and i can tell you he is honest, and does a great job for his customers. Awesome service, knowledgeable, and great turnaround time. Highly recommend Dan and his company! We had a great experience with Scrib’s Heating and Cooling. Dan and his team were extremely professional, friendly and thorough. The installation was smooth—fast and with minimal disruption. We are very pleased with our new central air, furnace and hot water heater. Highly recommend this company. Scrib’s installed a new hot water heater and whole house humidifier this week. This is the second time I’ve utilized their services. I can say for certain, Scrib’s will be called for any other HVAC issues moving forward! Dan runs a great crew, nice work vehicles , great customer service, excellent installation and clean up, at a fair price! Absolutely call Scrib’s!!! Extremely professional and honest. Showed up the same day I called. Thanks Dan for helping a fellow CHS Alumni out on a hot day! We just had Scrib's Heating and Cooling come out for the second time to our house for issues. Let me tell you, these guys are awesome. They respond fast. They are friendly, considerate and trust worthy. If you ever need help with your air conditioning or furnace, these guys are your answer. The first time they came they gave me some ideas I could do on my own to fix the problem, so anytime they need to fix something I know I can trust them. Dan and the guys did a fantastic job from start to finish. Great communication from the first phone call, on time for every visit to the house, extremely fair pricing, clean/quick work...can't say enough good things! Thanks again!!! Highly recommended! Dan and his team are great to work with and very fair. I would consider this the perfect experience. Dan and his team were professional, informative, friendly and confident. Very competitive on price, everything was done with top notch quality. I would recommend Scrib's to anyone that asks and even to people who don't ask! Thanks Dan and team. It was a pleasure. Thank you thank you! I called this morning and you worked around my work schedule. Did what needed to be done, and ONLY what needed to be done. Friendly, professional. Will use again! Thank you for coming on such short notice and getting us up and running. Very much appreciated! Scrib's treats you like you are a member of the family! Today they answered my call, came to the house, and fixed the problem in less than 45 minutes! I'm so thankful to be able to 100% trust everything they do! Scrib's is truly the BEST! Thanks for the great job installing my new furnace and central air. Your crew was on time, courteous and friendly. Jeff explained operation functions and went over the warranty. I will be sure to recommend your company to my family and friends. THANKS SO MUCH!!!! My husband left a message for Dan at 7:15 this morning and our air was working by 10:00! Great customer service and honest. Very impressed! Dan is the owner of Scrib's Heating and Air Conditioning. He provides expert service and quality to heating and cooling systems. He responded to my furnace issue the same day, fixed the unit, and made recommendations on preventative maintenance to extend the life of my furnace. Highly recommend! Dan is a cool guy �, Him and his team installed an AC unit for me a couple weeks ago. They did the job right, and were very professional. From my experience, I would highly recommend Scrib's! My hot water heater went out and Dan had a new one installed within 24 hours. Very professional and genuine. I highly recommend! I have never dealt with such a honest and professional company like Scribs Heating and Air Conditioning. Dan pin pointed my furnace issue and repaired it within minutes. Beat his competitors by hundreds of dollars. Amazing company. Dan's crew just left my house after installing a new humidifier on my furnace. After dealing with another company (J&J) that was trying to take advantage of me, I am so happy I was referred to Scrib's. They did a professional job for a reasonable price, and left my house cleaner than when they got here, and made sure I knew how to adjust everything myself. I would recommend Scrib's Heating & Air Conditioning to anyone needing these services! These guys are the best. We had a new furnace installed this week. Great product, prices, and professional crew. I highly recommend them. Exceptional and reliable service. I recommend his company to all my family & friends, give him a call.